St. Michael’s Church, located at 80 Meeting Street at the "Four Corners of the Law", was built between 1752 and 1761 on the site of the original St. Philip’s church house built in 1681 and subsequently damaged by a 1710 hurricane and rebuilt several blocks away. In 1751, the St Philips congregation split, and the residents of the lower half of the city formed St. Michael’s. During the Revolutionary period, St. Michael’s quickly became the city’s focal point of Colonial resistance. The church tower, a target for ship gunners, was painted black but that made it more visible against the blue sky. Its lead roof was melted down for bullets, and the steeple functioned as a navigational landmark and observation post. It is not known who is responsible for the two-story stuccoed brick Georgian style edifice, but the two-story portico facing Broad Street —a replicate dating from the late 1880’s of the original, which was damaged in an 1886 earthquake—was the first of its size in Colonial America and features Tuscan columns. The steeple rises 186-feet in height, with a 7½-foot weather vein. The interior still retains its traditional 18th century design, with a three-sided second story gallery and native cedar box-pews, including Number 43, known as The Governor’s Pew, which was used by George Washington on May 8, 1791 and General Robert E. Lee in 1861. The original pulpit is remarkable for its height and the massive sounding board supported by two Corinthian columns. The Victorian Altar was presented in 1892 as a memorial. 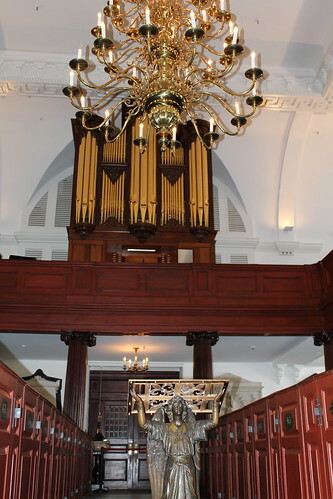 he original organ, made by John Snetzler in London, was installed in 1768. The case, which was altered several times, was refinished and restored to its original configuration in 1994 by Kenneth Jones of Bray, Ireland. Jones built a new 40-stop, 51-rank tracker organ to fit in and behind the Snetzler case. St. Michael’s had one of the first choirs of surpliced boys in this county. The Vestry records mention them as early as 1794. The clock and eight bells bells, originally imported from England in 1764, were taken back there as a prize of war during the Revolutionary War, but purchased and returned by a London merchant. During the Civil War, they were sent to Columbia, where they were cracked in a fire in 1865. Salvaged, the metal fragments were sent to England where they were recast in their original moulds and eventually rehung.